First Time Pass/ Only two minors ! 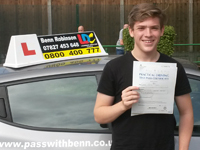 I would fully recommend Benn and the LDC driving school to anyone wanting to drive. The teaching method is great with all learners receiving a work book which is extremely clear and well structured. Information is simply given along with diagrams and quizzes to help you learn and revise. The elements are also split into chapters, with a progress chart so you can see how well you are progressing and what you still need to work on. 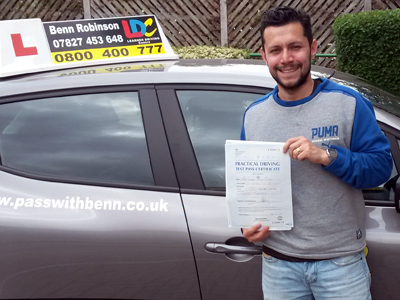 Benn is an excellent driving instructor, friendly, and very calm which is a must. 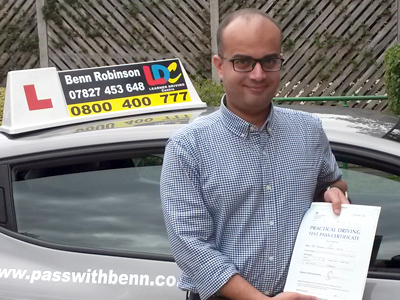 Confidence is a big part of learning to drive safely, and Benn helps you to gain confidence in your capabilities. He also teaches you how to keep calm on the roads. Thanks for everything Benn ! 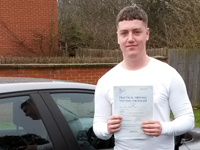 First Time Pass, zero minors, clean sheet ! First Time Pass/ Only four minors ! Benn was an excellent driving instructor. He always tried to accommodate me for lesson times. 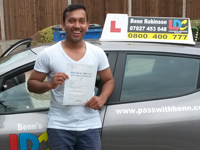 He was calm and thorough with his teaching and gave me confidence with my driving. He was friendly and helpful and prepared me well for passing first time. 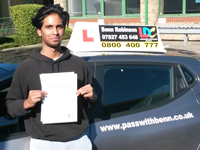 First time pass with Benn !! Firstly I would love to say that I am so happy to have met Mr Benn. He was the best driving instructor that I have used. I've had so many other instructors, but failed with them. He understands students' needs and teaches patiently. As an instructor, he is very friendly and his technique is absolutely easy to catch. Finally I would like to say that I give him 5 stars out of 5 because he knows how to make students happy and how to fulfill students goals. I have passed............I am so happy !! Benn is calm, professional and patient as an instructor. I passed my driving test with him first time. 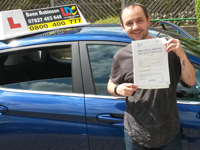 My confidence increased learning with him as I was a new driver in the UK. Driving in the UK was a big challenge to me. He worked with me patiently to correct my mistakes and my faulty previous habits. He taught me a good systematic approach for all roads and driving situations which was easy and I will never forget. I highly recommend him to anyone who wants a good instructor following a well reputed system (LDC system). Thank you Benn ! Looking forward to life on the road ! Benn was a very good instructor. From my first lesson, right up until the day of my test, his teaching method was very clear and his instructions were easy to follow. Throughout the course i found him to be very patient and polite. By the time my final lesson arrived, it felt less like a driving lesson and more like going for a drive with a mate. 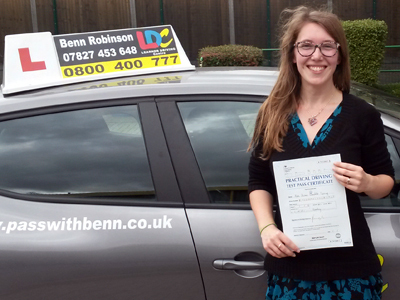 I would have no hesitation in recommending Benn to anyone who was thinking about learning to drive. The LDC learning materials are really useful, and the structure easy to understand with clear learning objectives. 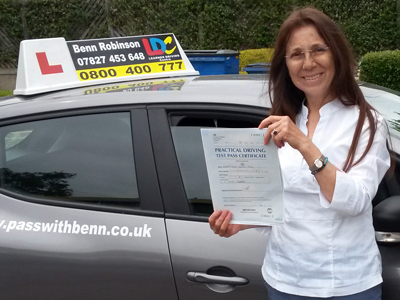 The instructor (Benn) was really professional, knowledgeable, patient, friendly and reliable. Overall a great learning experience, taking me from not knowing much to passing my driving test. Thank you to Benn, and the LDC materials provided. I highly recommend it ! First time pass / Only four minors ! First Time Pass/ Only one minor ! Benn my instructor......he has great teaching skills that motivated me to do the full driving course after having not driven for over 30 years. The method he used was clear, easy to understand and his friendly and reassuring voice always helped me to gain confidence. He prepared me well to drive in all weather conditions and to be able to accurately perform all manoeuvres safely. He helped make the driving lessons a fun and interesting experience. The LDC learning programme that we used was great theoretical support for the practical lessons and helped me to learn at a quicker pace. It was a great way to pass my test FIRST TIME, and I did it with ONLY ONE MINOR !